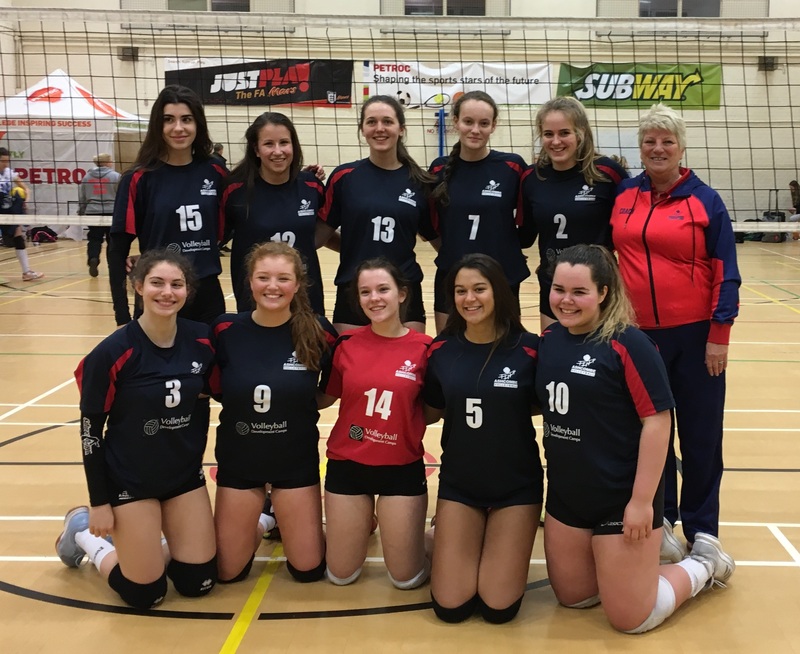 Ashcombe Dorking Under 18 Volleyball team traveled to Barnstaple on Saturday 19th January to play in the second round of the National Under 18 championships. Their opposition was Bishop Llandaff School, Cardiff, Taunton, Richmond B and Petroc Beach Academy. The Ashcombe team started nervously against the well drilled Cardiff side but soon got into their stride with powerful hitting by Leah Blight and dominant serving by Brandi Head and Lyndsey Harris sealed a simple victory 2-0. Taunton beat Beach Academy in their first game so Ashcombe knew they would have a hard battle in their second game against Taunton. Coach Freda Bussey kept the team’s tactics simple with high attacking through the wings and tight blocking in all zones. Middle blockers Andrea Tudorache, Ellie Kim and Grace Gerwe tied down the Taunton attack and Ashcombe took a simple 2-0 victory. In their third game Ashcombe faced old enemies Petroc Beach Academy, a team they had lost to in the past 2 years. Ashcombe were to prove dominant again and this time Meena Adi, Gillian Quinn and Lyndsey Harris found the floor with attacks through position 4 and setter Brandi Head was able to give the middle attackers some fast attacking options. Luiza Zeitune proved a strong substitute, her defensive skills proving valuable against the high hitting Beach Academy. The fourth game was quickly won by Ashcombe beating Richmond 2 in just 35 minutes. Another 2-0 victory for the young Ashcombe team. Winning all matches 2-0 was a great result for Ashcombe, this showed maturity and determination to not drop their standards throughout the competition. The Last 8 competition takes place on Sunday 10th March at The National Volleyball Centre, Kettering.